The issue of divinizing in South Asian traditions has not been examined before as a process involving various methods to affect the socio-cultural cognition of the community. It is therefore essential to consider the context of "divinizing" and to analyse what groups, institutions or individuals define the discourse, what are the ideological positions that they represent, and who or what is being divinized. 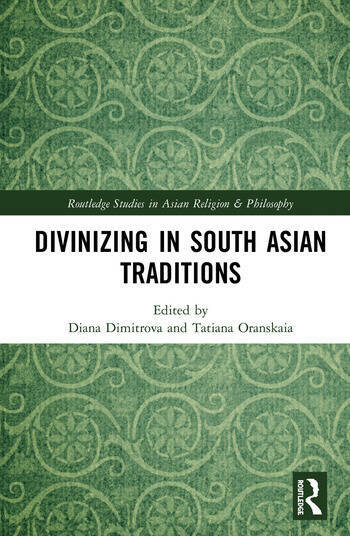 This book deals with the issue of divinizing in South Asian traditions. It aims at studying cultural questions related to the representations and the mythologizing of the divine. It also explores the human relations to the "divine other." It studies the interpretations of the divine in religious texts and the embodiment of the "divine other" in ritual practices. The focus is on studying the phenomenon of divinizing in its religious, cultural, and ideological implications. The book comprises eight chapters that explore the question of divinizing from the 2nd century CE up to present-day in North and South India. The chapters discuss the issue both from insider and outsider perspectives, within the framework of textual study as well as ideological and anthropological analysis. All articles explore various aspects of the cultural phenomenon of being in relation to the divine other, of the process of interpreting and embodying the divine, and of the representation of the divinizing process, as revealed in the literatures and cultures of South Asia. Applying theoretical models of religious and cultural studies to discuss texts written in South Asian languages and engage in critical dialogue with current scholarship, this book is an indispensable study of literary, religious and cultural production in South Asia. It will be of interest to academics in the fields of South Asian studies, Asian Studies, religious and cultural studies as well as comparative religion. Diana Dimitrova is Professor of Hinduism and South Asian religions at the University of Montreal. She is the author of Western Tradition and Naturalistic Hindi Theatre (2004), Gender, Religion and Modern Hindi Drama (2008), and Hinduism and Hindi Theater (2016). She is also the editor of Religion in Literature and Film in South Asia (2010), The Other in South Asian religion, literature and film: Perspectives on Otherism and Otherness (2014), and the co-editor of Imagining Indianness: Cultural Identity and Literature (2017). Tatiana Oranskaia is Professor (retired) in the Department of Culture and History of India and Tibet, Asien-Afrika-Institut, University of Hamburg. Among her numerous publications are Pronominal Clitics in Indo-Iranian Languages (1991, in Russian); Goddesses, Heroines and Lady-Rulers in Asia and Africa (2010, ed. with B. Schuler, in German); ‘Impure Languages’: Linguistic and Literary Hybridity in Contemporary Cultures (2015, ed. with R. K. Agnihotri and C. Benthien).